Again the specifics of this job must still remain confidential. Unlike the declassification of my work areas at SHAPE the Canadian Government has a much more guarded view on declassifying military activities. One other Canadian based temporary assignment of note that I will briefly comment on is related to the October 1970 crisis in Quebec. This crisis was set in motion by a series of events triggered by two kidnappings of government officials by members of the Front de Libération du Québec (FLQ) during October 1970 in the province of Quebec, mainly in the Montreal metropolitan area. I was sent to Montreal and Québec City to assess the situation for the Government of Canada. It seems that the reason for my selection was that I was considered one of the only experts in sabotage and guerilla tactics (based on my war time activities with the Polish AK), I was very familiar with intelligence workups (being the head of IP4), and was what they claimed to be the armed forces first fully bilingual officer. Therefore I would be able to assess and communicate effectively on the ground. When I walked into our first meeting in Montreal I found another secondary reason that enhanced the review process. 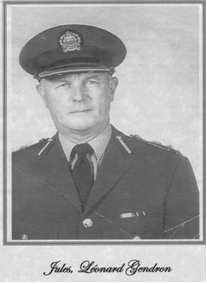 Sitting at the table was my brother–in–law Len Gendron who at that time was head of Security for the QPP! Just as we both were surprised to see each other in an official capacity, everyone at the table was very surprised that we actually knew each other. Len was there to report to Drapeau and Bourassa and I was to report to my military command and ultimately to Trudeau. The details of my activities and the specifics of my report will have to wait formal declassification by the Canadian government. My general assessment was that the government was grossly over reacting with far too many military personnel being flown into the St. Hubert military base without anything to do. Brooks is reported to have commented something along the lines of, that by any assessment, it seemed that the so called terrorists were nothing more than punks with guns. My input was provided and, along with inputs from a variety of other sources, the government acted. The outcome on October 16th was the only peacetime usage of the War Measures Act in Canada's history, done by Governor General of Canada Roland Michener at the direction of Prime Minister Pierre Trudeau, having been requested by the Premier of Quebec, Robert Bourassa, and the Mayor of Montreal, Jean Drapeau. The invocation of the act resulted in widespread deployment of Canadian Forces troops throughout Quebec. The military remained in a support role to the civil authorities of Quebec. I liked my job in the Intelligence Division. By 1970 I had been in the armed forces some 30 years. It had been the only employer I had really known. I was 49 years old and I had a decision to make. If I was to think of ‘retiring to a civilian job’ then I would have to move soon before I became too old to be hired. I had been a little frustrated of late with the slow progress made with the armed forces unification process that was initiated February of 1968 when the Royal Canadian Navy, Canadian Army, and Royal Canadian Air Force were merged into a unified structure. My title had changed from Wing Commander to Lieutenant– Colonel with unification. As perhaps might be expected, there was a lot – too much in my opinion – politics between the forces as to jockeying for position, for authority, who had to approve what decisions to get things done etc. It just wasn’t the same anymore. The esprit de corps seemed to be missing. "Did I want to stick around while the system sorted itself out or take the opportunity to try something new one last time while I had the chance?" After thinking about it a lot, I decided that I’d very much like to make a clean break and settle in to a lower tempo retirement job. Bea laughed at this as she knew I always threw myself into my work and that throttling back was just not going to happen. Thirty years was a pretty good run for service to the Government of Canada. The question was what could I do? Looking at the newspaper at varied management type jobs led me quickly to the conclusion that I probably could meet the requirements as far as practical hands on management, but didn’t stand a chance for requested educational background. I spoke to a number of close friends about what I was thinking and got the lead I was looking for from my ex–RCAF friend Don Forsyth. There was an entry level management position opening in the administration at Université d’Ottawa. It was clear from the outset that I did not meet the BA, MSc preferred educational requirements. However I got the job interview. We clicked and they seemed more than happy to accept me based on my past on–the–job experience. I gave the Forces six months notice and retired after 31 years of service. I was proud and very content with my time in the military. I had experienced more of the world than I could have imagined when I enlisted some 31 years prior and made some lasting friendships around the globe. But it was time to leave. My last day with the Canadian Forces was 4–September–1971.